One of my favorite bits of wisdom shared in an old blog post about getting the most out of your massage was from our therapist, Justin. He recommended that clients figure out an easy dinner plan or have a meal going in the slow cooker so after their service, they don’t have to worry about cooking, dishes, or grocery shopping. I love this advice so much I’ve started doing it myself! 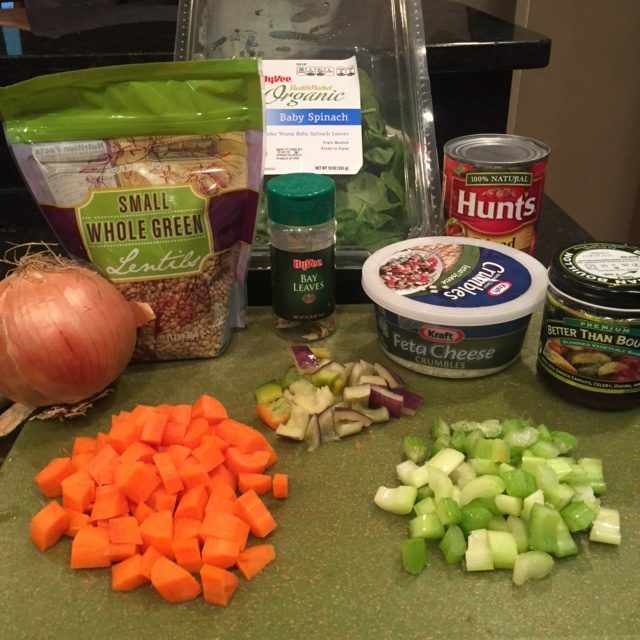 Last week, I made one of my favorite vegetarian (easily made vegan) crock pot lentil soups, inspired by a recipe from my favorite vegetarian restaurant, the Chicago Diner. I was SO GLAD this was waiting for me at home on massage day or I would have caved and picked up a super unhealthy carry-out meal because I was too relaxed to cook! Toss all ingredients except spinach, feta, salt, and pepper into a crock pot. Set on low temperature for 10 hours (perfect if you’ve got your massage right after work!) After 10 hours, toss in a few generous handfuls of spinach to wilt, add salt and pepper to taste. Serve with a sprinkle of feta cheese and a side of bread or a few crackers. I’d LOVE to hear your favorite hearty and easy meals to enjoy on massage days! Need a massage day? Click here to book yours online! Yesterday was a perfect day for a cold salad on a warm deck with a chilled glass of white wine or iced tea. 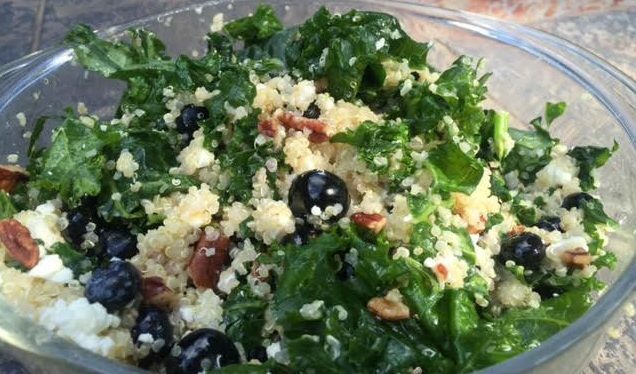 I’d been traveling for 10 days and I could tell my body was craving “real” food so I turned to a favorite, Blueberry, Kale, and Quinoa salad. 4-6 big handfuls of Kale from a bag of salad-ready Kale (it will be tender enough you won’t have to pre-cook it) No Kale? Spinach works great too! 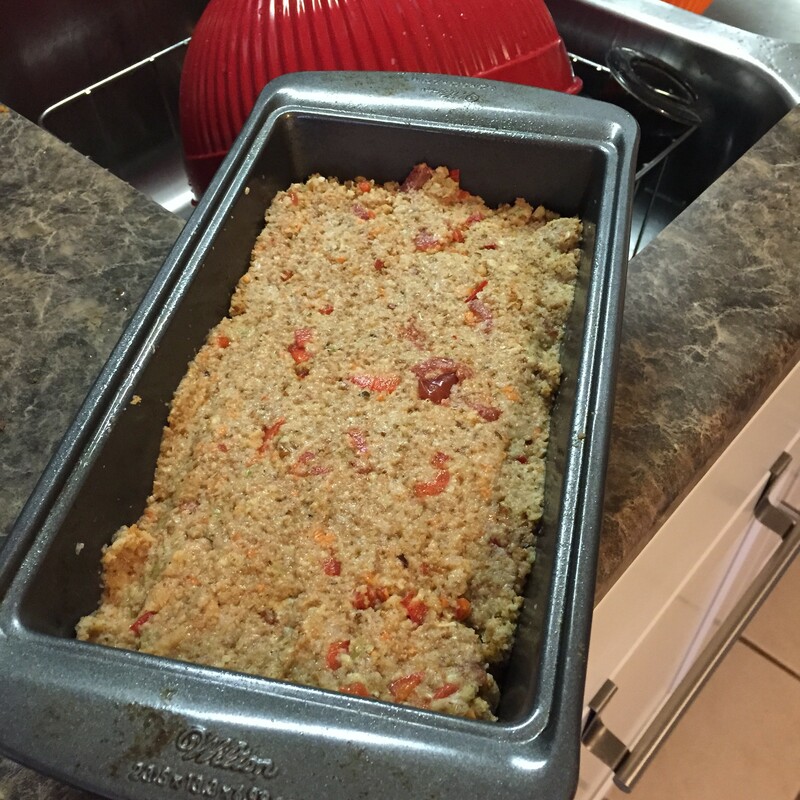 *If you don’t have package directions, bring 3/4 cup quinoa with 1 1/2 c. water to a boil on the stove top. Cover pan and continue to simmer on low to medium-low heat 15 minutes. If all water is not yet absorbed, cook a few more minutes. Toss with dressing to coat and chill for at least an hour to let flavors combine. Adjust salt and pepper as needed. Serve cold or room temperature. 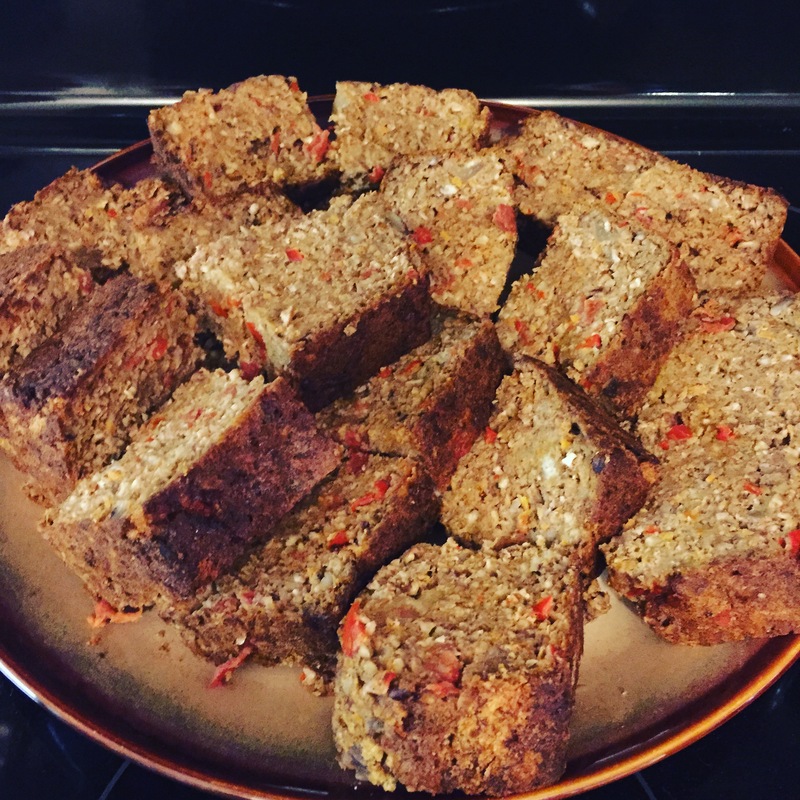 Thanksgiving is my favorite holiday, and as a vegetarian, I never feel like I’m missing out because I can make a killer vegetarian meatloaf and amazing veggie gravy, then enjoy all the wonderful sides. For nearly 10 years, we’ve done thanksgiving with friends, typically at least half the group is vegetarian. In recent years, I’ve started doubling my recipe because it freezes well and the leftovers are great for a week. If you are trying to cut back meat or are going to have a vegetarian guest at some point this winter, give this dish a try! Note: This dish requires a food processor, you could use a blender, but I think it would be really tricky. Preheat oven to 375 and lightly spray a loaf pan with oil. 2. 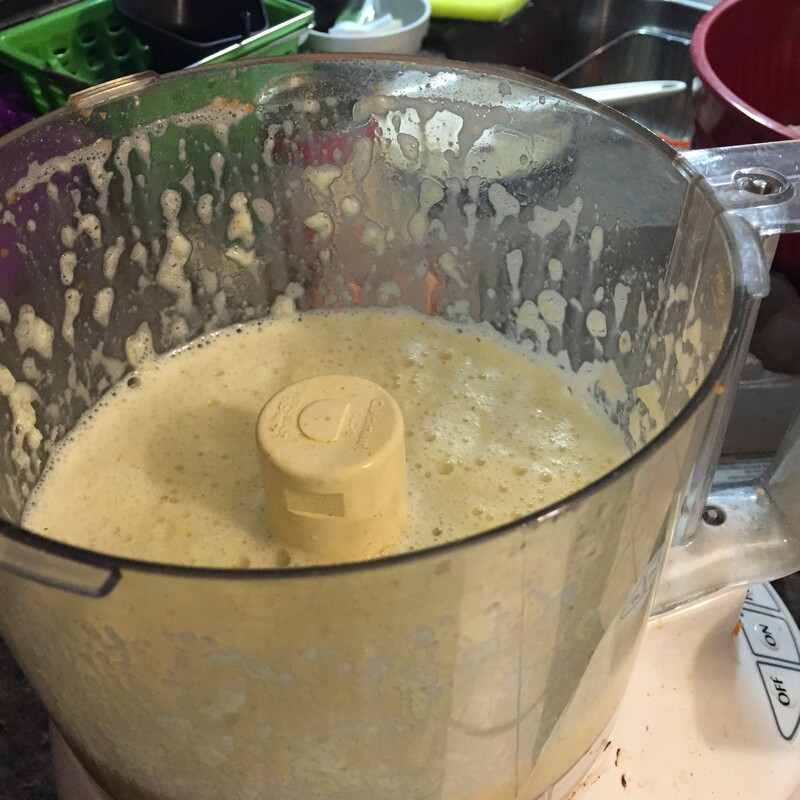 Tear up the cooled, toasted bread into the food processor and process into bread crumbs. Toss in a large bowl. 3. Process the pecans into fine crumbs and toss into the large bowl with the bread crumbs. The dry ingredients, plus the veggies. 5. Crack 3 eggs into the food processor and add the onion. Process together into a frothy mixture. The onions should be very fine and it should be a liquid. Pour into the large bowl with everything else. Blend the 3 eggs and the onion until (for lack of a better word) frothy. 6. 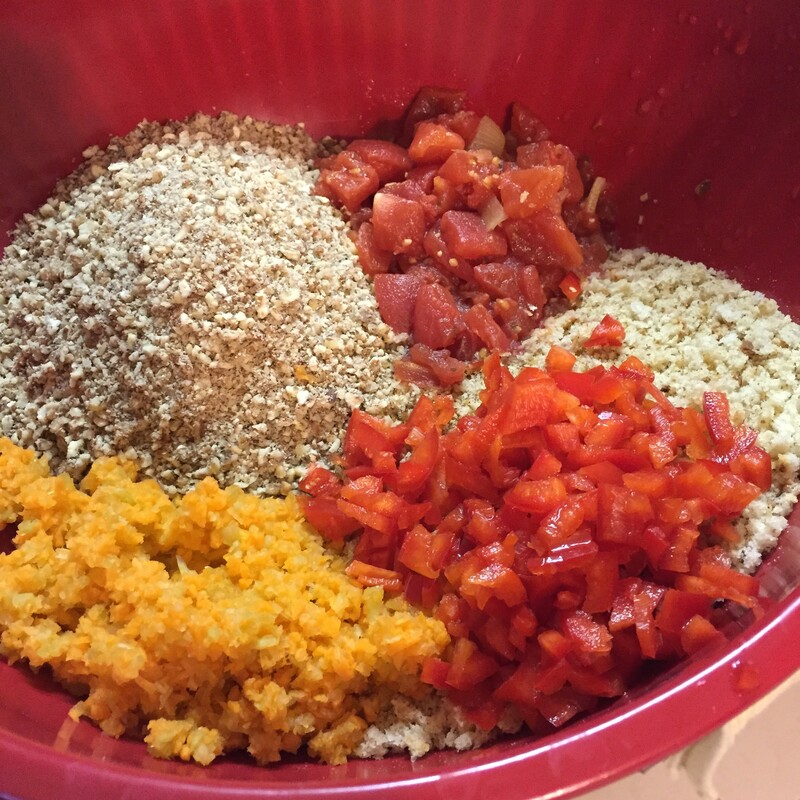 Add the olive oil and diced tomatoes, plus salt and seasonings of your preference to the bowl and mix well (you might want to use your hands to make sure it is evenly mixed. 7. Pat into the prepared loaf pan and bake covered with foil for 60-70 minutes, remove foil and bake another 10 minutes. Top with veggie gravy (I love the Chicago Diner recipe), BBQ Sauce, or Ketchup. The gravy recipe takes awhile to thicken once it cools, and I think it is even better the second day. You can find nutritional yeast typically in the health food section of the grocery store, but I’ve found it in baking sections too. I usually have to ask. Fun tip: If you make the dry base for the Chicago Diner gravy recipe, it makes a TON. I’ve taken extra and bagged it with the directions to give as holiday gifts to my fellow vegetarians. If you try it, please post a comment and let me know what you think!